Parenti was the first ‘Leghista’ – a supporter of the League, the organisation formerly known as the Northern League – in a town of around 8,000 people that’s long been a party stronghold. In Lazzate, the League regularly wins close to 70 percent of the vote in local elections. For a long-time follower of a group once confined to the fringes of national politics, witnessing party leader Matteo Salvini and his colleagues taking up senior government posts in Rome feels like a minor miracle. However, not all Leghisti in Lazzate share Parenti’s optimism. 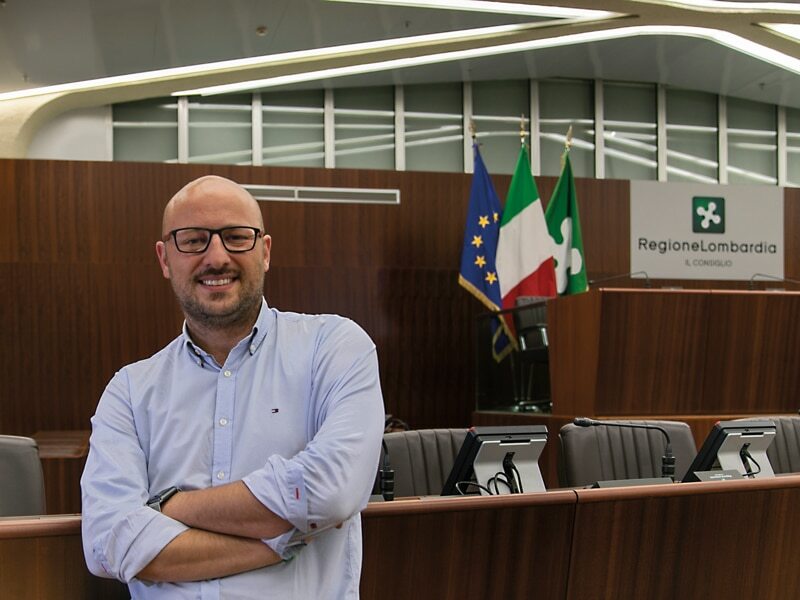 “Some people think politics is like football and winning is everything that matters,” says Andrea Monti, the local head of the League in Lazzate and a councillor in the regional parliament of Lombardy. “But what use is winning if it comes at the cost of your ideas?” A self-assured man in his late thirties, Monti thinks something has fallen by the wayside during the party’s long journey to power. The League is now a major force in Italian politics, but for some supporters here, its success has come at a price. “It all started when a friend and I went to a nearby town to hear Umberto Bossi speak,” says Laura Parenti, who dresses in pink, carries a tiny dog called Trilly and refuses to be photographed for fear that she won’t look good – not, perhaps, the sort of person who leaps to mind when you think of a stereotypical far-right voter. As party leader, Bossi switched between calls for greater autonomy for Italy’s northern regions to demands for full-blown independence – in 1996 he declared Padania an independent republic, although his unilateral secession wasn’t taken too seriously. His speeches were fiery, provocative and eccentric, mainly targeting the Italian state and the south of the country; his hostile rhetoric regularly drew criticism from across the political spectrum. Despite the party’s rabble-rouser reputation, Parenti’s dream was realised in a few short years. From the mid ’90s onwards the League dominated in Lazzate, thanks in part to Andrea Monti’s father, Cesarino, who became mayor and then a regional senator. 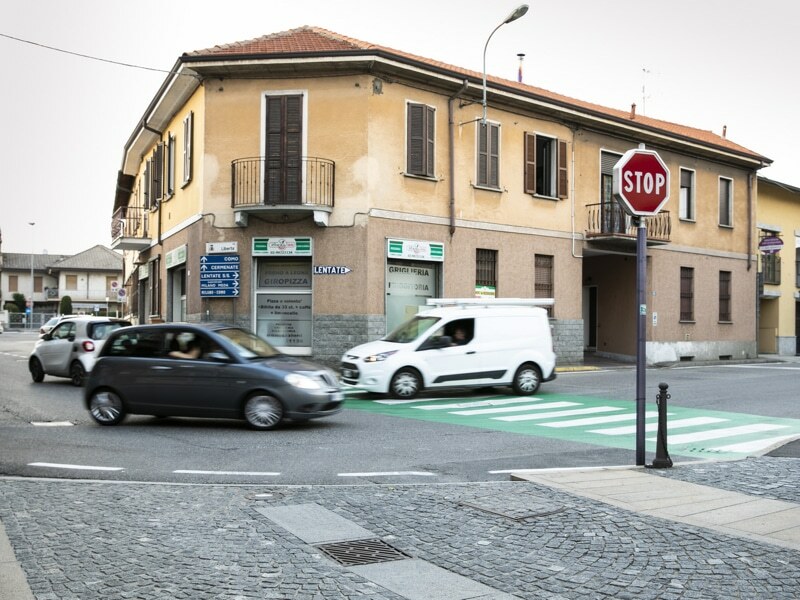 Cesarino made some eye-catching cosmetic changes to help cement Lazzate as a spiritual home for the party: a sign was erected welcoming visitors to ‘Padania Town’, a street was renamed ‘Padania Road’ and zebra crossings were painted green, the colour of the Padanian movement. 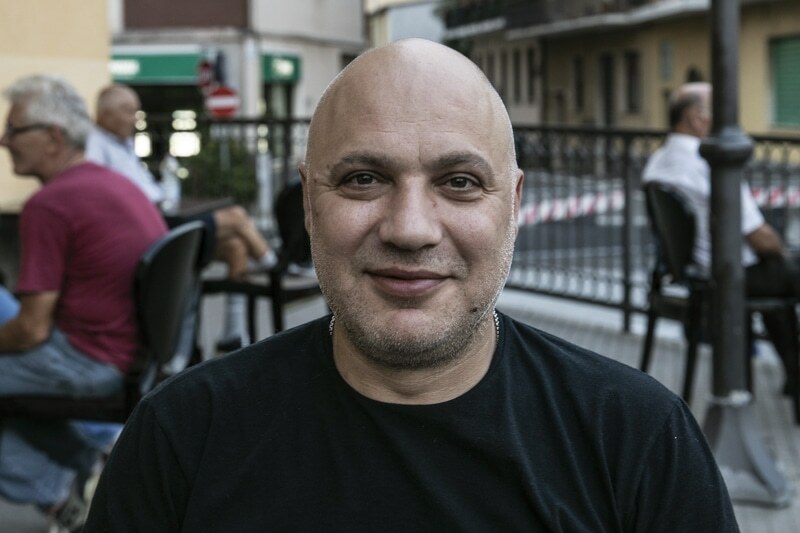 In 1998, Cesarino caused a standoff with national authorities after passing an act favouring locals over other Italians for civil service jobs in the area. A massive demonstration took place in Lazzate in support of his policy, which was attended by thousands of people – including a 26-year-old Matteo Salvini. Over the next decade and a half, the League failed to reproduce its local success at a national level. In 2012, Bossi resigned as party leader after allegations that he had used hundreds of thousands of euros of public funds to pay for personal expenses, creating a power vacuum at the top of the party. 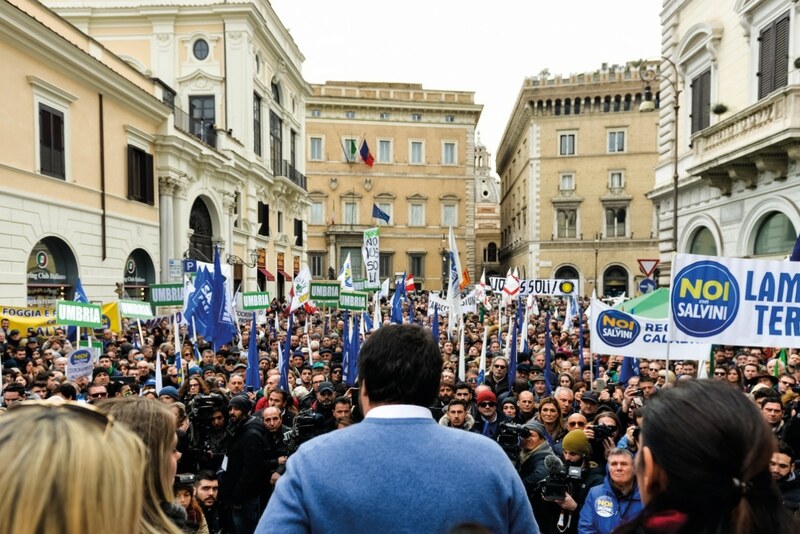 Salvini’s stature, meanwhile, had been growing steadily – in 2012 he defeated Cesarino Monti to become the Lombardy branch leader, and in December 2013 he became the party’s national leader and began transforming it. A man who had worn a pro-IRA T-shirt at the 1998 Lazzate protest and who was once filmed singing a song with lyrics about how even dogs ran away from “smelly Neapolitans”, did something that would once have been inconceivable in the Northern League. He made peace with the south. In 2014 he launched a sister party to the Northern League, Noi con Salvini (‘Us for Salvini’), designed specifically to cater for southern Italians. The secessionist rhetoric stopped. Old symbols disappeared – the colour green was avoided, there were no more references to Padania, and as the number of migrants arriving in Italy increased dramatically, from 42,000 in 2013 to more than 170,000 in 2014, a new enemy was targeted. Bossi had always advocated severe immigration policies and had been accused of racism on occasion, but now Salvini was putting xenophobia centre stage. He called for Italy to disengage from humanitarian work beyond its borders, to cease search-and-rescue operations in the Mediterranean and to lower the weekly allowance the country pays to refugees. He frequently attacked the European Union. Salvini’s political agenda, which he branded a “common-sense revolution”, didn’t merely resonate with the anger and fear felt by many ordinary Italians during Europe’s migration crisis. It also appealed to neo-fascists, around a thousand of whom reportedly attended a League demonstration in Milan in 2014. A party that had campaigned for the breakup of Italy was now a nationalist party. ‘Northern Italians first’ had become ‘Italians first’. The enemy was no longer Rome and southerners but Brussels and undocumented migrants. But the metamorphosis of the party under Salvini had raised the eyebrows of its grassroots members. Some agreed with Roberto Maroni, briefly party leader between Bossi and Salvini, who was filmed proclaiming that “turning the League into a national party means disavowing its roots”. Other long-time supporters lambasted Salvini as an opportunist who abandoned the party’s ideals in a cynical bid to gain power. In the run-up to the 4th March 2018 election, Salvini promised to deport 500,000 undocumented migrants, called Islam a “threat” and was filmed saying that Italy needed “mass cleansing”, although it wasn’t entirely clear to which group or groups he was referring. He also campaigned in Sicily, Italy’s southernmost region. On election day the League, which had quietly dropped the word ‘Northern’ from its name, won nearly 18 percent of the vote in a campaign dominated by the debate over immigration. Five years earlier, the party had claimed only four percent. When the League joined forces with the biggest party in parliament to form a populist coalition, it seemed like an odd pairing. The anti-establishment M5S rejects the left-right paradigm. It couples support for universal basic income with a murky party structure and ownership and an interest in direct democracy facilitated by the internet – although its stance on immigration has toughened in recent times. The parties dubbed their unorthodox compact the ‘Government of Change’. Matteo Salvini was made deputy prime minister and the minister of the interior. The League now held real power. In July 2017, Emanuele Lucini received a text message that concerned him. The Lazzate local felt compelled to tell his fellow residents about the news: that two refugee women and two children were being resettled in the town. Banners began to pop up: “Hands off our town” and “We won’t concede an inch”. Hundreds of residents protested and Matteo Salvini travelled to Lazzate to take part. The protests went on for days and, according to some witnesses, the refugee women were heckled and had eggs thrown at them. They fled town a few weeks later, and never returned. As evidenced by the large turnout for the demonstration organised by Lucini, Salvini’s tough anti-migrant policies have been welcomed by many in Lazzate. Yet a crack in the party has started to become ever more visible. Many Lazzate Leghisti have dutifully followed their leader on his path towards nationalism, but others have held on to the old symbols and rhetoric, clinging to the Padanian dream even as Salvini travelled to southern cities and apologised for his party’s founding principles. The League’s local branches can no longer be relied upon to stay on message: they honoured a separatist tradition by campaigning for the independence of Catalonia, while the national party stayed quiet. And the League-controlled region of Lombardy defied Salvini’s nationalist line by calling a referendum to push for greater autonomy in October 2017. Change comes slowly to Lazzate, where the zebra crossings remain resolutely non-zebra-coloured. The ‘Padania Town’ sign still stands at the town’s entrance. And Padanian green still plasters the walls of the local party headquarters, where Loredana Pizzi sits as mayor. 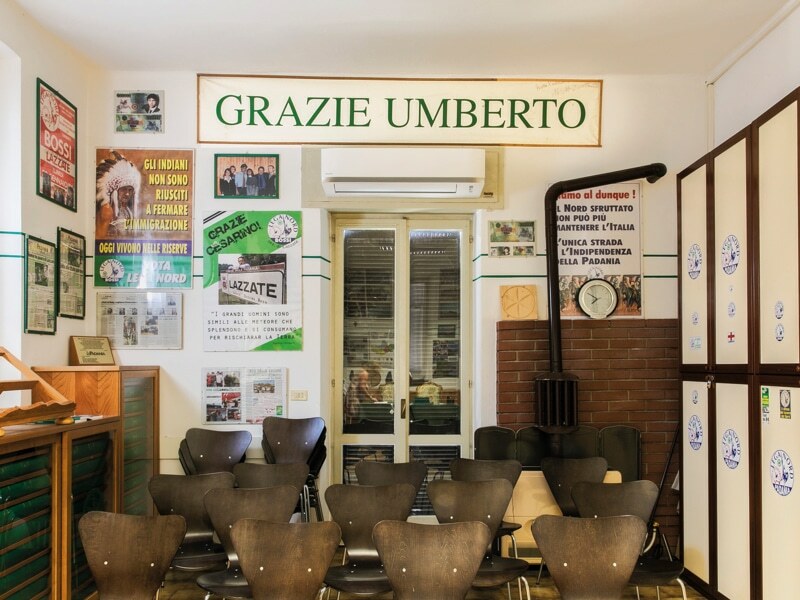 “The Northern League was a passion that conquered you, a party you felt beating inside you,” she says, reminiscing about the era of Umberto Bossi, who was convicted of fraud in July 2017. The walls of her office are plastered with memorabilia from the period: a copy of the Northern League newspaper published after the historic 1998 protest hangs from a wall, with a headline in block capitals: ‘Rome Fears Lazzate’. Pizzi invites me to listen to Bossi’s declaration of Padania’s independence in 1996. “It is the best speech I have ever heard,” she says. Pizzi holds up the placard used by Salvini throughout the 2018 campaign. With white capital letters on a blue background, reminiscent of Trump’s ‘Make America Great Again’ poster, it reads: “Salvini Premier – ideas, heart, courage”. There is no green, no mention of the north. There isn’t even the word ‘League’. “I think Salvini is a great leader and is doing great things, but I would never have opened to the south,” says Pizzi. Andrea Monti’s reaction to news of the coalition government was also bittersweet. The party to which he and his father had devoted years was now in government and he assures me that this made him happy – “Grassroots members are at the peak of exaltation,” he says – yet the green plastic wristband he wears bearing the word ‘Padania’ points to conflicting emotions. A few weeks after the formation of Italy’s ‘Government of Change’, Lazzate held local elections, and, again, the League triumphed. But on the day of the first meeting of the Lazzate council, a League politician stood outside the council building, holding a sign stating that he was “With Salvini. With residents. Discriminated against.” Fabio Del Mastro handed out letters to the town’s residents. “I am a contemporary Leghista, one who believes in Matteo Salvini’s project,” it read. “Lazzate’s League is stuck at 2010. Stuck with Umberto Bossi as secretary. But the ‘common-sense revolution’ has started here too.” While Andrea Monti is dismissive of the leafleting council member, it’s hard not to see it as a sign of change – the reality on the ground catching up with Lazzate’s Padanian dream. Recently, Monti admitted to me that he was worried that Lazzate wouldn’t be able to keep the ‘Padania Town’ signs up – the national party might apply pressure to remove them. It will be hard to say no. By mid-August 2018, the League was far more popular than at any time in its history. In his first few weeks in government Salvini caused an international furore when he refused to let the MS Aquarius, a humanitarian rescue boat carrying 629 refugees and migrants, dock in Italy. He claimed victory when Spain stepped in to accept the boat, which had spent several days at sea and was close to running out of food and medicine. On 14th August a bridge collapsed in Genoa, killing 43 people. Salvini took the opportunity to blame the European Union, arguing that the budget constraints it placed on Italy had prevented the country from repairing its infrastructure. His strident approach doesn’t appear to be doing his standing or career any harm. In recent polling the League has overtaken M5S to become the most popular party in the country – and Salvini may well be Italy’s most popular politician. On a hot night in August I sat down with Andrea Monti, Loredana Pizzi and other League members at a summer festival started by Cesarino Monti. A member of our party complained about the direction the League has taken, moving away from its secessionist origins. A hush fell on the group. On 6th September 2018, a court in Genoa authorised the immediate seizure of €49 million from the League following a fraud investigation into the scandal which saw Umberto Bossi sentenced to over two years in prison. The rumours heightened speculation that Matteo Salvini would declare bankruptcy and relaunch the party with a new name to avoid paying the bill. The League, formerly the Northern League, would cease to exist. Italian newspapers speculated that Salvini’s new party might be called the “National League”. This entry was posted on Tuesday, January 15th, 2019 at 2:07 pm and is filed under Delayed Gratification magazine, From the archive, Stories.